TechRepublic recently released its poll of phone recommendations in the workplace. While the iPhone has the most marketing muscle behind it, it turns out that Android based phones are enjoying a healthy lead in the workplace. 50% of IT professionals are recommending Android phones to their workers, and with good reason. Android has replaced the struggling Blackberry as the de facto email workhorse. Its ability to easily synchronize multiple accounts from any platform is something users have been looking forward to for years. Coming in second is Apple’s popular iPhone, which is a capable business phone but has a few factors that may limit its appeal in the workplace. 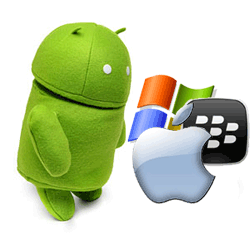 Bringing up the rear are Windows Mobile and Blackberry. Surprisingly, 13% of recommendations are for Windows Mobile 7 phones. Microsoft is struggling to get their new phone platform into the hands of users, and while its mobile operating system is getting high praise, the Nokia phone hardware it’s being featured on is not. What is interesting is Microsoft has only gained about 2% of the phone market, so the fact they scored as highly as they did may be good news for them. Blackberry was the former king of the smartphone, and is a perfect example of what happens to a company when they don’t keep up with the times. Blackberry used to make mobile email so convenient and addicting that people would call them “Crackberries.” Unfortunately, not showing any innovation for a decade and terrible business decisions have made people jump ship, which leads to a lowly 2% recommendation for the Blackberry platform. I myself usually recommend Android phones because they are a natural fit for Google Apps. The growing number of businesses using Google Apps makes smartphone integration very simple. Android’s default Gmail app works great with your Google apps email address: simply enter your email address and password and your email, calendar, and contacts automatically synchronize with your phone. The available larger screens on Android phones makes it easier to work with as well. In fact, there’s a handy little guide right here to walk you through the process. Apple’s iPhone isn’t a bad choice either. It has a well developed user-base, and can handle your email and contacts, but the calendar function seems to be a bit limited. The 3.7″ screen is also getting a bit cramped these days. I have a lot of users complain about checking multiple email accounts as well…Apple’s email client doesn’t seem to be as robust as its Android counterpart. It’s a good phone, but it doesn’t fit every situation. Windows phones are in their infancy and it shows. I can’t really recommend Windows Mobile for business at this point because it is severely under-developed. At this stage, Microsoft is trying different strategies to see what works, and right now there’s a lot of things that don’t work. A lack of apps, less than stellar hardware, and a flaky email client are keeping me away from an endorsement, but at least Microsoft recognizes the problems and is working to improve them. It may be a better choice in a year or so when Windows 8 settles in. We’ll have to see what kind of syncing and interplay Microsoft has in store for the platform. Blackberry: don’t bother. The Blackberry platform as a whole is a one-trick-pony, and that trick is email. Today’s business environment requires so much more. The only reason one would consider a Blackberry is if you are locked into the platform…and if that’s the case it may be time for a change. I fear Blackberry may not survive the next two years much less provide a quality phone anytime soon. Not all Androids are created equal, however. I was switching phones late last year and wanted to try the Android. I can’t stand the touch screen keyboards though (my fingers are large and the touch keyboards don’t work well for me) and wanted to get one with a slide out or a “Blackberry style” qwerty keyboard. I got a Motorola model that was slated as the business Android version. It had a Blackberry style keyboard. I spent days trying to get the email to sync up with my corporate Exchange email and it would not do it. My carrier tech support was of no help. They referred me to Motorola. They were worse – rude and said it was my problem. I sent the phone back and went back to my (very) OLD Blackberry 8830 that after 5 years still worked flawlessly. Well, I thought I’d try it again and went with a Samsung product recently – 4G WITH a slide out full qwerty keyboard. It took all of 3 minutes to enter the field data and for it to sync up with my Exchange email, calendar, and contacts (all 194 of them, at that time)!!! It has been MUCH better than the Blackberry was since it does so much more. The only downside is the battery life isn’t there yet on the Androids – 4G mainly. I only say all this to make the point that if one Android doesn’t work try another brand of phone. The OS may be the same, but how the phone’s manufacturer taps into and utilizes the OS appears to be what makes the difference. All in all, I am happy with the Android, so far. It sounds like you had a Motorola Droid Pro, which is a 2 year old phone. All 4G phones suffer from reduced radio life. It has to do with the amount of power 4G radios consume. Next Next post: 8 New Gmail Features: Google Has Been Busy!